Ever wondered how to cook brisket, from choosing the right cut to slicing and serving? The most important thing to remember when it comes to brisket is to cook it low and slow. With a good recipe and the proper technique, brisket becomes tender and juicy, the perfect centerpiece for a holiday meal. Let’s talk brisket! 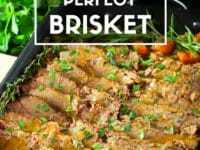 Brisket is a time-honored cooking tradition for the Jewish holidays; barbecued and smoked brisket are both popular in Texas and throughout the South. 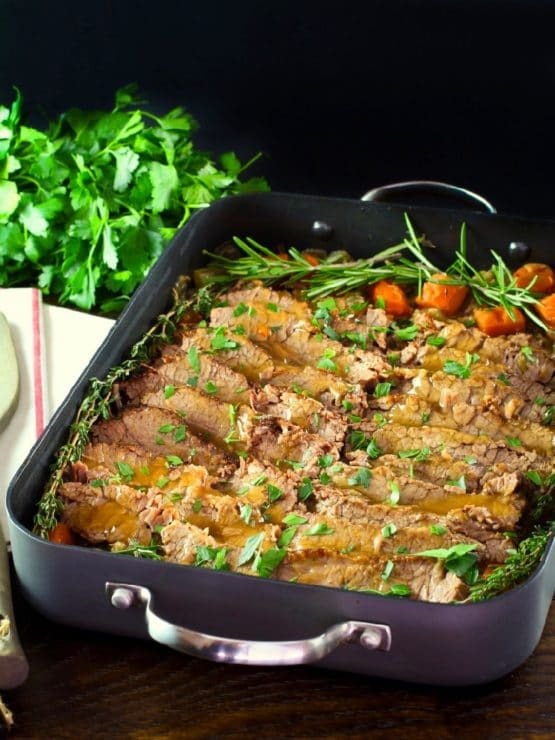 Passover, Rosh Hashanah, and other Jewish holiday gatherings often feature a meat dish as the center of the meal. Traditionally, the meat of choice at a Jewish holiday table is the brisket cut, because it’s a kosher cut that can feed a lot of people (more bang for your buck). It’s a great choice for any occasion where you have a lot of people to satisfy, whether or not you’re celebrating a holiday. So, have you ever tried to make a brisket? Have you ever failed miserably? I’ll admit it… I’ve been there. This notoriously tough cut of meat can be difficult to master. Through the years I’ve learned many pointers for cooking a delicious, tender brisket. It does take a bit of practice, but with a few helpful tips and a great recipe, you’ll be brisket-cooking like a pro! 1) Pick a great cut of meat. The higher quality the meat is, the tastier your brisket will turn out. I buy organic, hormone-free meat whenever possible. Choose a cut with plenty of fat; the more fat there is, the more tender the end result will be. For special occasions when you are cooking brisket, fat is key. 2) First Cut vs. Second Cut. Readers often ask me what cut of brisket is best – first or second cut. I generally recommend first cut, untrimmed. The first cut is easiest to find in supermarkets; it has a flat shape and a thin layer of fat. Second cut will also work – it is shaped like a point, and has a lot more fat. 2) Get the right size brisket for the amount of people you will be entertaining. Generally, butchers recommend calculating about ½ pound per person, uncooked weight. I always get at least two pounds over the recommended amount, which allow for guests taking larger portions, and will hopefully leave you with some nice leftovers. 3) Don’t trim the fat. Many recipes call for trimmed brisket, but I always leave my brisket untrimmed. 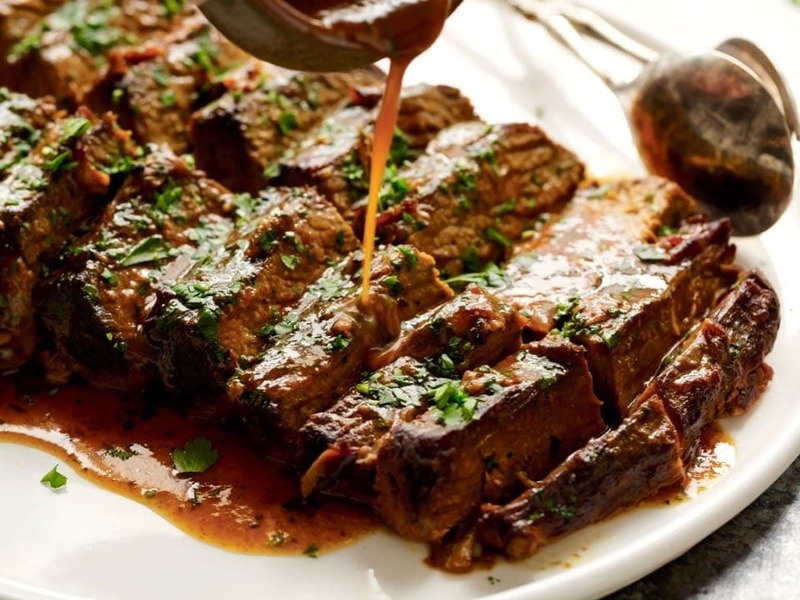 The extra fat makes more cooking liquid, which keeps the brisket moist during the long, slow cooking process. Without the fat, the brisket will cook up dry with a cardboard-like texture, and will require a lot of sauce to make it palatable. 4) Grass fed brisket needs extra attention. I am a big believer in choosing grass fed, organic meat from responsible farms. If you choose to go this route, know that it can take a very long time to make a grass fed brisket cook up tender. 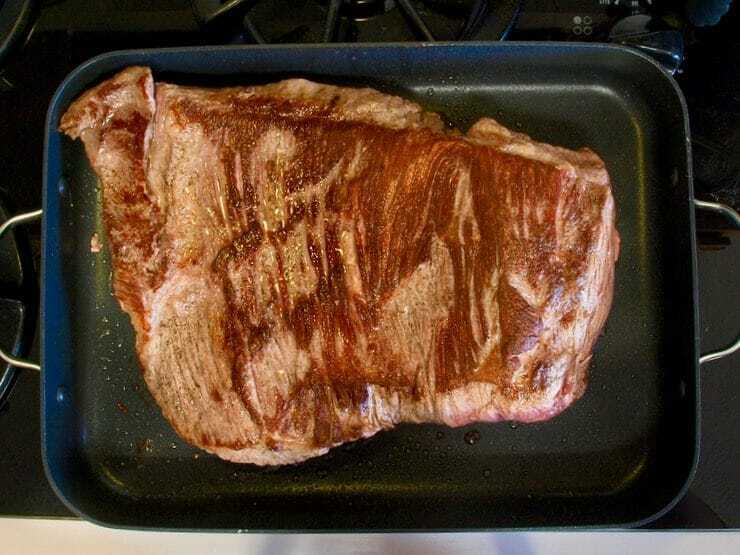 Grass fed brisket is naturally lean, and it will take a longer time for the connective tissue to break down. If using a grass fed cut, consider using a slow cooker on low setting. If using the oven, lower the recipe temperature to 200 degrees Farenheit and let it cook a few hours longer than the recipe states, even up to overnight. This will give the brisket ample time to break down and become tender. Some grass fed briskets I have cooked have taken 14 hours or longer to become really tender. Be patient, it will eventually get there! Check liquid levels periodically to make sure it doesn’t dry out. If the recipe has additional vegetables or herbs, add those about 4 hours before the end of cooking so they don’t get over-done. If using a grass fed cut, definitely consider making a day or two ahead to give yourself ample time to cook and prepare. 5) Kosher brisket is pre-salted, so salt with care. It’s best to cut back on the salt in most brisket recipes unless they are specifically written for kosher salted brisket. Generally, if using a salted brisket, I opt to cut back the salt in the recipe by about a third. You can always salt more to taste at the end of cooking. 6) Make sure your roasting pan or slow cooker is big enough for your brisket. It’s okay if the meat initially looks scrunched in there, traveling up the sides… it will shrink a LOT during cooking. A heavy roasting pan with a lid, or a covered Dutch oven, will be very helpful for cooking your brisket and keeping it moist. Here is a high quality roasting pan option, a cheaper lighter version, and a fantastic Dutch oven. If you don’t have a pan with a lid, make sure you cover it tightly and completely while it cooks. 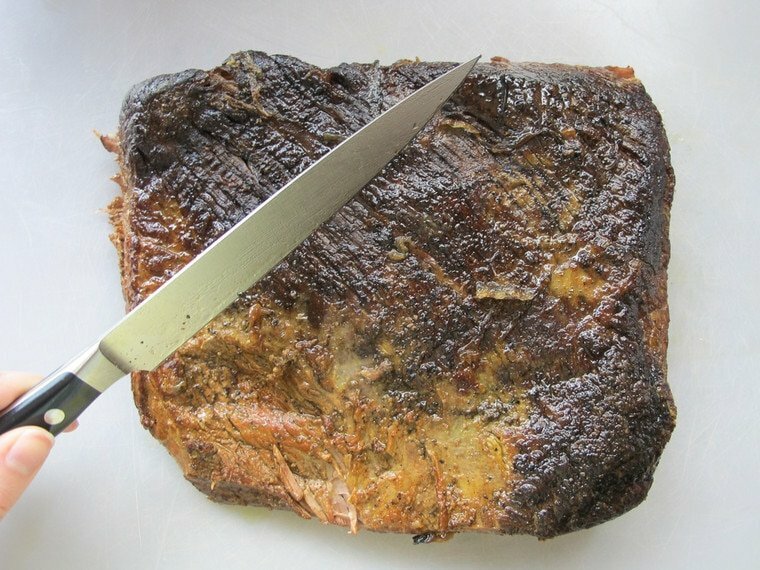 I use a layer of parchment paper followed by a layer of aluminum foil; the parchment keeps the foil from direct contact with the brisket. In addition to the potential health concerns surrounding foil, aluminum can break down during slow cooking when it touches acidic sauces containing tomato or vinegar. 7) Running short on oven space? Use a slow cooker! Aka a crock pot. A large-capacity slow cooker is a great alternative for those who are short on oven space, or trying to keep the temperature in the home from getting too hot. 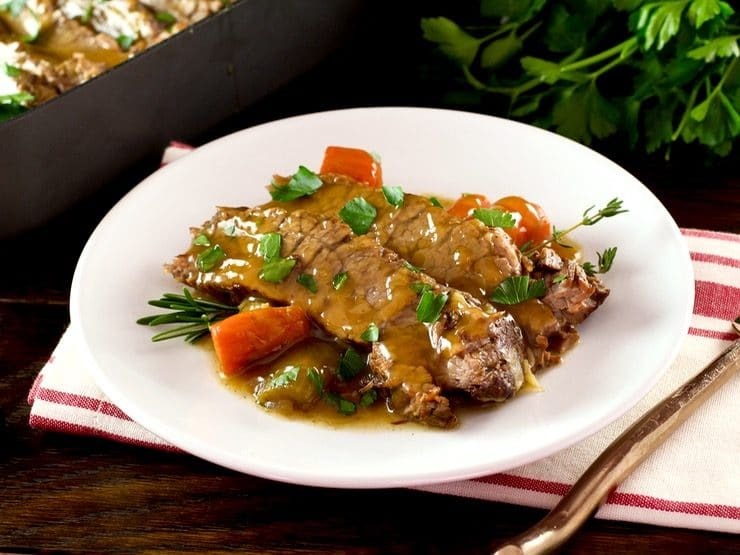 I have some recipes specifically crafted for the slow cooker, including my Savory Slow Cooker Brisket and my Slow Cooker Honey Barbecue Brisket. 8) Consider making your brisket in advance. If you have the time and foresight to plan ahead, make your brisket a day or two ahead– the meat will improve with time. I like to prepare the brisket the day before I serve it, then put it in the refrigerator overnight. This saves prep time on the following day, and the flavors deepen overnight, which makes it taste even better. Make Ahead Brisket Instructions: Make sure the brisket cools for about 20-30 minutes before putting it in the refrigerator. 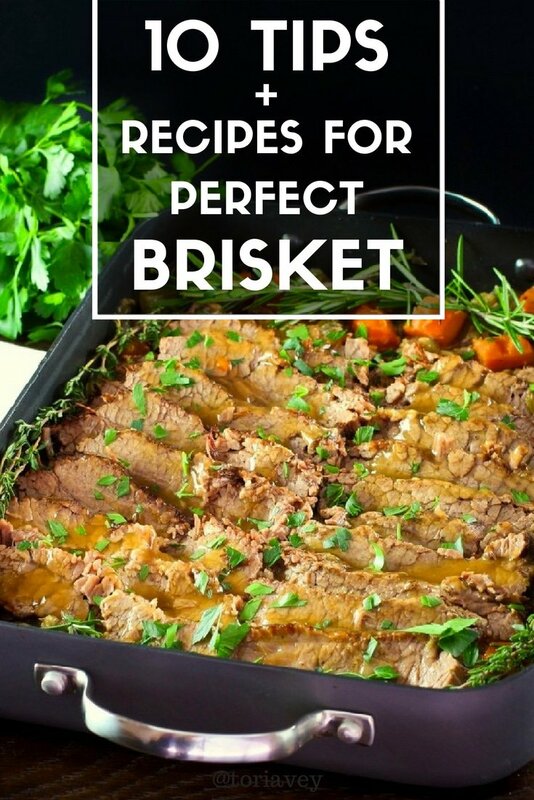 Place the brisket and cooking juices/sauce in a glass or ceramic baking dish. Cover it with plastic wrap (not foil, which can react if there is any acid in your sauce). Do not slice it. Cover brisket in the meat juices to let it marinate. 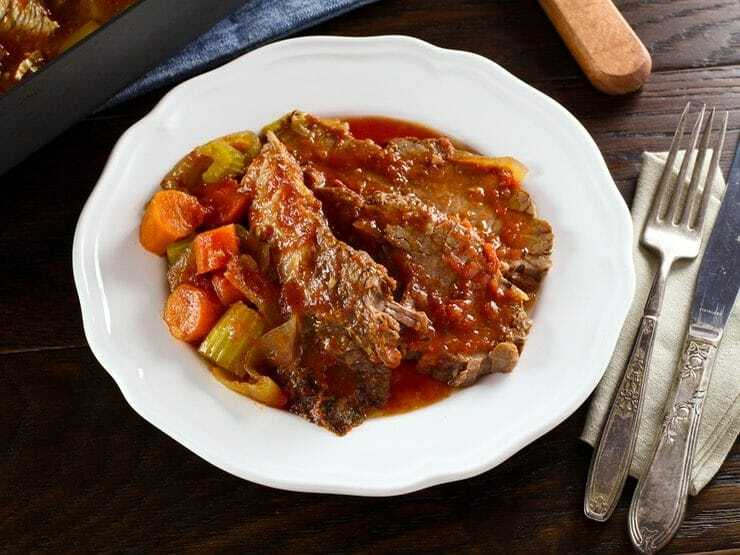 When you are ready to serve the brisket the next day, take it out of the refrigerator and skim the hardened fat that has risen to the surface of the sauce. Discard the fat pieces. Take the brisket out of the sauce and slice it cold. Place the slices back in the baking dish and spoon the sauce over the sliced meat. Cover the meat tightly with a layer of parchment, followed by a layer of foil, then warm it in the oven at 350 degrees F for 45-60 minutes, checking periodically to make sure it doesn’t get dry. If you don’t have a lot of cooking liquid, you may want to add some water or broth. You can cook the meat even longer to make it more tender if you wish. 9) Slice against the grain. Briskets have a distinct graining to the meat – if you look at the lines in the meat, they will generally be running in one direction. The key with getting a clean slice is to cut against this grain. First, cut any large fat caps off of the brisket. Place the knife at a 90 degree angle from the direction of the grain line, and slice in that direction. This will ensure that you get clean slices which don’t shred or fall apart too much. Be sure to use a high quality chef’s knife, and keep it sharpened! 10) Choose a tasty and time-tested recipe. This is the most important tip of all, especially if you are new to brisket! 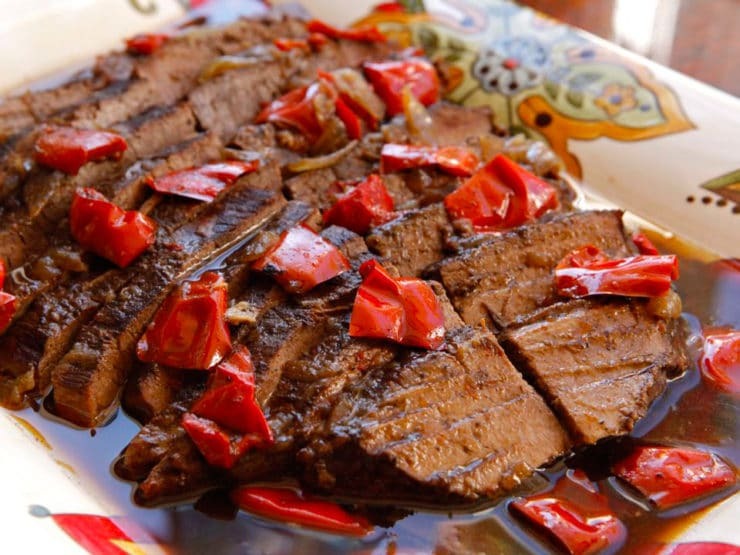 Below you will find some of my favorite brisket recipes, all tried, tested and true. Read the user comments to learn more about these recipes and how they work in a home kitchen. I really enjoyed reading your article. Very informative. I usually cook my brisket in onion soup, almost covering the whole meat, for hours in the oven over low heat. 9 out 10 times it’s worked. Is this recommended? You can certainly make it that way. I would recommend pan-searing beforehand for deeper flavor. If you want some variety try one of the recipes linked above. Holiday Brisket! Growing up in NYC the Jewish Holidays were a time I was invited to share my friends parents and grandparents recipes. As a kid it was a time for me to learn about my friends’ religion,sit at their table and share in the love, food and meaning of their Holidays. I’m so grateful when I think of the country today, that I was raised among the tapestry of the many people and cultures that make America so special. We weren’t afraid of people’s different customs, religions, celebrations, but embraced them all. Thanks for reminding me of the excitement of going back to school and looking forward to Rosh Hashana, Yom Kippur. Sukkot and experiencing all those beautiful memories that mark so many wonderful moments of my life! Hi Tori, the brisket recipe was great, very tender and flavorful. Maybe too tender as it broke apart when slicing. I followed the recipe for an eight pound piece. It was first cut, and Kosher. What would cause it to not hold as a slice when cut? Hi Mike, cooking too long can make it overly tender. Towards the end of cooking you need to keep a close eye on it to see that it doesn’t go “too far.” Be sure to slice against the grain as described above. A very sharp knife will also help when slicing an over-tender brisket. Will it be OK without reheating? Just to slice and serve after refrigerating overnight. I need it for a cold buffet lunch. You could, but it’s really better heated. If you’re going to do this, I would suggest slicing it very thin and trimming any fat pieces. First i love you web-sit. I am making Your Brisket for the first time. Can i make it two days ahead .Thursday and serve on Saturday. kugel’s. Thank you for great recipes. Hi Joyce, Tori’s assistant Ashley here. Making ahead will be fine. Tori generally likes to have 1/2 pound per person, so this should be plenty for 5 people. My open house is coming up… I am serving 3 medium tin pans of pulled pork, 20 sandwiches, and a few of a different noddles salads and some desserts.. we are estimating that 50-60 people will show up. we also want to get some brisket.. how many pounds do you think we should get? Hi Kassey, Tori’s assistant Ashley here. Most butchers recommend 1/2 lb of brisket per person and Tori usually gets an extra couple of pounds. Since you’re having other things, I don’t think you’d need quite so much. I am hosting my husband’s office party in our home. I’m having difficulty figurine out how much brisket to order (pre-cooked) brisket for approx 40 people. We will have other vegetarian dishes but hoping you can help. Hi Joan, Tori’s assistant Ashley here! Typically you should plan for about 1/2 lb of meat per person, so 20 lbs of brisket should be enough. If you want to be generous with portions you can always add to that. We are meeting up with 16 people for a lake weekend later this month. I like to prepare in advance so that I don’t have to cook all day. I have done brisket several times in a roaster oven and it turned out beautifully. My question: Can I cook the brisket, let it cook and then freeze it before slicing it. It will be in a frozen state for a week – we are stopping on the way to the lake for a retirement party – 2 day detour. Hi Susan– yes that should be fine. Just make sure you factor in enough thaw time, a frozen solid piece of meat can take quite a while to safely defrost. Hi- I struggle with how long to cook the brisket and at what temperature. Last year I followed a recommendation to put it in at a really low temperature, e.g. 200 degrees, for six hours. It came out terribly dry and I had to chuck it. The year prior it came out perfectly, but I cannot remember if I had cooked it at 300 or 350 and for how long. What is your advice on this? I have 12 pounds of raw brisket, and will be cutting into quarters, so 3 pounds for each slab of meat, each in its own pan. Hi Lori- it really depends on the recipe you’re using. I generally recommend cooking brisket low and slow, so my guess is your dry brisket was the result of a recipe rather than the cooking temperature. Most of my recipes recommend a cook temp of 300 degrees F and a cook time of 1 hour per pound of meat. But again, the results will vary widely based on the recipe you use. 325 degrees for about 5 hrs, or Until it is fork tender, i.e., you can stick a fork in it with little resistance. I i’ve done this for years and that usually works. Depending on your oven, it could take a little more or a little less, make sure to put plenty of liquid in the pot, withWhatever seasoning you are using. I plan to slow cook my 4lb brisket in the slow cooker on low. For how long do you suggest? This is my first brisket! Thanks! 7-9 hours depending on how hot your slow cooker is (they tend to vary on how hot the low setting is). Enjoy! I plan to make the brisket a day or two early and refrigerate. Can I heat it up in the slow cooker as my oven will be busy? What temperature and for how long do you suggest? Kim, yes! Slow cookers vary in terms of heat level. In mine I reheat the refrigerated brisket on high for 1- 1 1/2 hours, that usually does the trick. Yours may heat faster or slower, depending on the wattage. Enjoy! I make grass fed brisket all of the time. The key is SLOW cooking. And by slow, I mean that it is not ready for at least 14 to 16 hours in a slow cooker. When I first started cooking grass fed briskets, I took them out at 8 hours, like most of the recipes call for. Well, they were still full of connective tissue. I next tried 10 hours, and the same issue. At 12 hours, they were starting to be tender, but could still use some additional cook time. I have since learned to “let it go” when cooking brisket and don’t even think of stopping cooking until at least 14 to 16 hours. If cooking vegetables with the brisket that I want to eat, versus blend into the sauce to thicken it, I wait to add the vegetables until the last 3 to 4 hours. Same thing with any seasonings other than salt and pepper. If I add them at the beginning of cooking, the flavor seems to just cook right out. I have no idea where it goes, as you would think it would flavor the sauce and meat, but nope….the flavor actually seems to disappear and taste almost “burnt”. I know the same thing happens with 24+ hour bone broth though (add vegetables for flavoring in the last few hours of cook time, so I guess it’s the same with slow cooker meat). Hope this helps! Hi Tory, can I add vegetables to the crockpot brisket recipe like the traditional oven version? Thanks! This will be my first attempt at brisket. Thanks for the tip on the weight. I wasn’t sure what was optimal. I love leftovers so I’m not concerned about buying too much. Just thought I’d post… I’ve found slicing the brisket before you refrigerate it overnight is better bc the juices really go between each slice making it tastier. That’s a good point Jess. The main reason I wait on slicing is because it’s easier to slice cold, the pieces hold together better and it’s not as messy. It’s really a matter of preference. Thanks, Tori! I’ve never made brisket and have 15 people coming for Passover. Your detailed instructions are making me feel more confident to give this a try. I plan to do it a few days in advance, so if disaster ensues, I’ll have time to try again… or purchase one cooked! Let me know if you have any questions Robin! I plan to slice and cook another hour tomorrow, before I serve. But when should I trim the fat? Before I refrigerate, or before I slice it tomorrow? If I don’t hear back, my gut says let it continue to sit in the fat, and trim it off tomorrow. But I hope you can respond before that! Thanks! Hi Sheri, your instinct is right– trim the fat after refrigerating, before you slice it tomorrow. Enjoy! Tori, I would LOVE to have your brisket recipe! My grandmother was not Jewish but worked for a family that kept Kosher for many many years. My grandmother passed away 4 years ago so I have no one to fix it for me and none of my Jewish friends ever have any left over from Passover. Hey Toni! 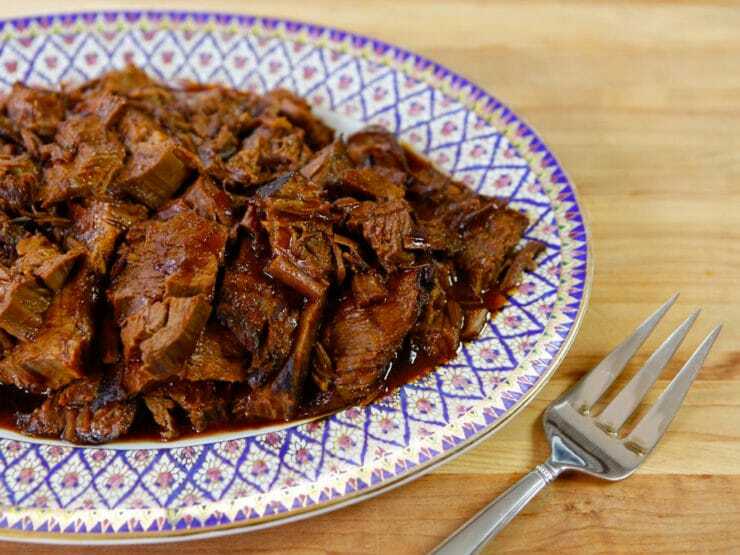 Here’s a simple brisket recipe for the slow cooker. I’ll be posting more brisket recipes in the coming months. Good luck! 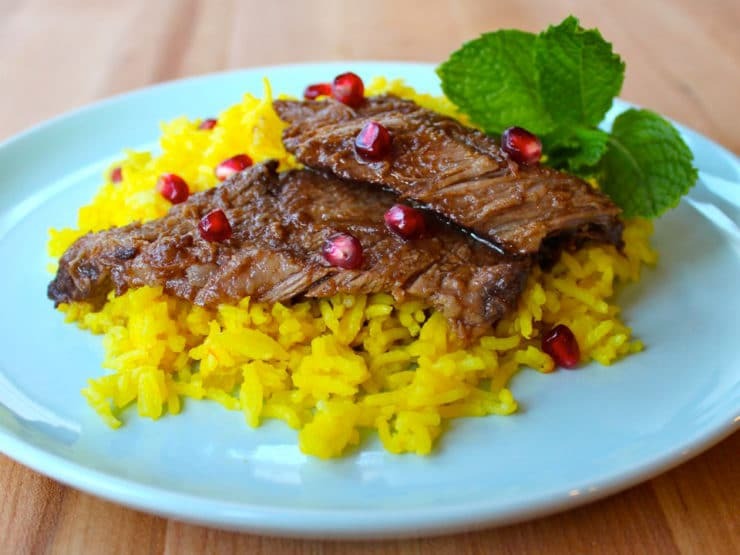 My wife is a vegan … can I come have brisket at your house for Passover sedar?